She took her son to his local doctor and an hour after they drew his blood, her doctor called and said that Bentley was being admitted to Randall Children’s Hospital. Parents Kala and Jay, who also have a 9-year-old daughter, left their home in Turner, Oregon, and rushed their young son to the emergency room. 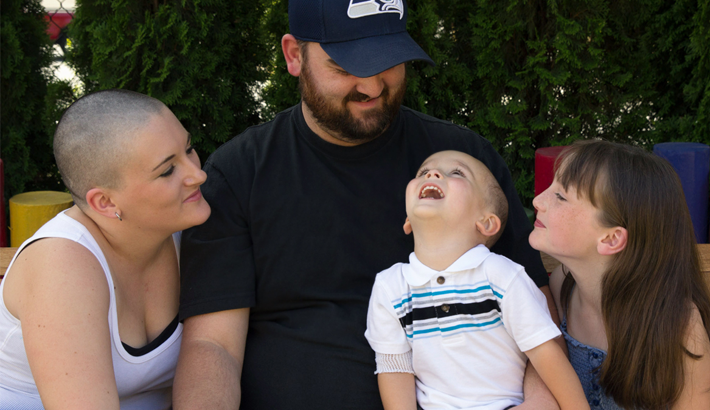 Their worst fears were confirmed, and Bentley was diagnosed with leukemia. He was scheduled for surgery the next day and would require weeks of intensive chemotherapy. Fortunately, the Ronald McDonald House had a room, and the family found a loving home just moments away from the hospital. Children stay at our Houses for a number of health reasons, but cancer is the most common diagnosis and last year almost 16% of all of our young patients – nearly 300 children just like Bentley – found a comfortable home and supportive community next to the hospital. For Bentley and his sister, the House provided more than convenience, it provided games and activities that helped make the experience less scary and less stressful.